Reconciliation is a classic New Testament concept. Though Jesus only used the term once, and Paul used it rarely, it is qualitatively the heart of the message and theology of the New Testament. It is not without antecedents in the Old Testament and Judaism, but in its full development is distinctively Christian. Its central meaning is the overcoming of an enmity. This enmity is towards humanity from God's side (i.e., his wrath), and towards God on the part of humanity (sin, rebellion, indifference, disobedience, etc.). Both parties therefore need reconciliation, but in the God-human relationship, God is the initiator. Paul is the only New Testament writer to use the actual terminology of reconciliation, specifically in Romans 5:10-12; Romans 11:15; 1 Corinthians 7:11; 2 Corinthians 5:18-20; Ephesians 2:16; and Colossians 1:20-23. Related concepts are forgiveness, justification, fellowship, sanctification, atonement, peace, freedom, "sonship" (i.e., filial relationship). These terms are employed by a variety of authors. Reconciliation with God (theological) through Christ becomes in Jesus and Paul the essential paradigm for all other relationships: to oneself (psychological); to one's neighbor (sociological); to the entire creation (ecological, cosmological). Reconciliation is the operative antidote to all consequences of the Fall, which may be described always as breakdown of relationship -- or enmity and conflict. "As the concept of shalom-peace is a harmonic of tesdeka-justice, peace is a harmonic of reconciliation" (Allard, 110). Christ's sacrifice on the cross epitomizes the understanding that God's justice vis à vis human conflict has reconciliation as its goal. Punishment and retribution as ends in themselves in response to human conflict (for example, crime) have no legitimate place in Christian vocabulary, action, or call to the state. Alternatively: "law is in the service of reconciliation and peace," a statement that is the conclusion and title of a major exegetical study of the New Testament on law (Meurer, Das Recht im Dienst der Versöhnung und des Friedens). "Remove the concept of peacemaking from proclaiming the Gospel and the very meaning of Gospel changes.... Reconciliation among humans is the identifying mark of God's new creation!" (Kraybill, 8, 12). That God's forgiveness is God's law is the breathtaking teaching of the New Testament. As in the Old Testament, law is quintessentially mercy. Old and New Testament texts point to this conclusion (see Lind, Transformation of justice: from Moses to Jesus; Meurer). Vengeance too is definitively at God's initiative (Romans 12:19) -- and is never the Christian's prerogative personally. Neither is the Christian to call for or desire vengeance by the state. But even from God's perspective, if he ". . . has willed the dire consequences that ensue on sin, it does not necessarily follow that he has willed them retributively, punitively. It may be that he has willed them as the only way of doing justice to the freedom and responsibility of the human personality, as he has created it" (Moule, 23). Vengeance is self-consciously omitted from Jesus' agenda -- even when he quotes Scripture with such themes in it (Jeremias). Against a centuries-long tradition of near universal acceptance by Christians, after the 3rd century, of vengeance and violence in response to human conflict, and in spite of the contemporary magisterial Reformers' renewed baptism of the "sword," with minor exceptions 16th century Anabaptists consistently rejected this traditional means of conflict resolution, conceiving it to be "outside the perfection of Christ" (Schleitheim Confession, 1527). Peter Riedemann's words of 1545 are representatively adamant: "Now if vengeance is God's and not ours, it ought to be left to Him and not practiced or exercised by ourselves.... There is therefore no need for many words, for it is clear that Christians can neither go to war nor practice vengeance. Whosoever doeth this hath forsaken Christ and denied Christ's nature" (Bender, 12, 13). The rescue by Dirk Willems. Engraving by Jan Luiken in Martyrs Mirror, v. 2, p. 387 of Dutch edition. 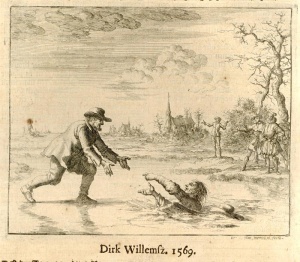 One of the period's poignant stories illustrating this is of Dirk Willems of Asperen, Holland, an Anabaptist who was being pursued because of his faith by a thief-catcher across the ice. When the thief-catcher fell through the ice Willems turned back to rescue him. Then, against the thief-catcher's will, Willems was arrested at the insistence of the burgomeister, and subsequently put to an agonizing death at the stake (Martyr's Mirror, 741-42). Anabaptist history is replete with similar stories. One 20th century example is the murder of an Amish baby, Adeline Schwartz, on 31 August 1979. An object thrown out of a passing pickup truck at a buggy killed the infant. In the subsequent investigation, four boys (occupants of the truck) were found to have been guilty of numerous previous attacks on Amish targets. The Amish community and the parents, however, steadfastly refused to seek vengeance or retaliation (Siegel). Programs reflecting this theology have recently emerged in North America, drawing as well from a wider renaissance of an "Alternative Dispute Resolution" approach to conflict, but adding their own biblical distinctives. In Canada, Community Justice Initiatives in Kitchener, Ont. is an umbrella organization for several programs with reconciliation the goal. The Victim Offender Reconciliation program was the first, starting in 1975. It deals with a variety of crimes at a post-trial level by bringing victim and offender together through a third-party mediator. The Community Mediation Service followed, offering a means of dispute settlement before cases go to trial. Victim Services ensued, assisting victims and offenders in sexual abuse cases. Most recently, the Network for Community Justice and Conflict Resolution has been initiated to coordinate disparate groups interested in conflict resolution and new justice models and systems. The network extends across Canada. In the United States, the Mennonite Conciliation Service began in 1975, emphasizing regulation over avoidance in a variety of conflict situations. It has cooperated with the wider network of Christian Conciliation Service chapters. In Elkhart, Indiana, a Victim Offender Reconciliation program was begun in 1978. In both Canada and the United States, and wider afield, these programs continue to develop apace. Allard, Pierre. "The Statement of the Correctional Service of Canada Values and a Biblical Perspective For the Role of Chaplain." D.Min. thesis, Northern Baptist Theological Seminary 1986: 70-131. An Annotated Bibliography of Mennonite Writings on War and Peace, 1930-1980, ed. Willard Swartley and Cornelius J. Dyck. Scottdale, PA: Herald Press, 1987, esp. 302-11. Bender, Harold S. "The Pacifism of the Sixteenth Century Anabaptists." Mennonite Quarterly Review 30 (1956): 5-18. Driver, John. Understanding the Atonement for the Mission of the Church. Scottdale, PA: Herald Press, 1986. Excerpts from Document Files of MCS, 1975-86, prepared by Dave Brubaker, MCS staff associate, presented to the MCS Review Committee of MCC U.S. Peace Section, 28 October 1986. Jeremias, Joachim. New Testament Theology, pt. 1: The Proclamation of Jesus, trans. John Bowden. London: SCM, 1971: 204-8. Klassen, William. Release to Those in Prison. Scottdale, PA: Herald Press, 1977. Kraybill, Ronald S. Repairing the Breach, Ministering in Community Conflict. Scottdale, PA: Herald Press, 1981: 7-14. Lind, Millard. Transformation of Justice: From Moses to Jesus, New Perspectives on Crime and Justice: Occasional Papers of the MCC U.S. Office of Criminal Justice, and MCC Canada Victim Offender Ministries, issue no. 5 (1986). Martin, Ralph P. Reconciliation: a Study of Paul's Theology. Atlanta: John Knox, 1981. MCC Peace Section Newsletter 16, no 1 (1986), sp. issue; "Mennonite Conciliation Service Historical Summary." McHugh, Gerald Austin. Christian Faith and Criminal Justice: Toward a Christian Response to Crime and Punishment. New York: Paulist, 1978. Morris, Leon. The Apostolic Preaching of the Cross. Grand Rapids: Eerdmans, 1965: 214-50. Meurer, Siegfried. Das Recht im Dienst der Versöhnung und des Friedens. Zürich: Theologischer Verlag, 1972. Moule, C. F. D. "Punishment and Retribution: an Attempt to Delimit Their Scope in New Testament Thought." Svensk Exegetisk Arsbok 30 (1966): 21-36. Rudy, Norma. "Community Justice Initiatives: a Major Study of Nonviolence." Unpublished paper, Conrad Grebel College, 1984 available from C. J. I. office, Kitchener, ON. Siegel, Barry. "A Quiet Killing in Adams County." Festival Quarterly (May-June-July 1981): 19-26. Swartley, Willard M., ed., The Bible and Law, Occasional Papers no. 3. Elkhart, IN: Institute of Mennonite Studies, 1982. Taylor, Vincent. Forgiveness and Reconciliation: a Study in New Testament Theology. London: Macmillan, 1941. Northey, Wayne. "Reconciliation." Global Anabaptist Mennonite Encyclopedia Online. 1989. Web. 21 Apr 2019. http://gameo.org/index.php?title=Reconciliation&oldid=162894. Northey, Wayne. (1989). Reconciliation. Global Anabaptist Mennonite Encyclopedia Online. Retrieved 21 April 2019, from http://gameo.org/index.php?title=Reconciliation&oldid=162894. Adapted by permission of Herald Press, Harrisonburg, Virginia, from Mennonite Encyclopedia, Vol. 5, pp. 746-747. All rights reserved. This page was last modified on 31 December 2018, at 14:05.